In 2015, Kijabe Hospital will celebrate 100 years of providing excellent medical and surgical care to rural communities in central Kenya. 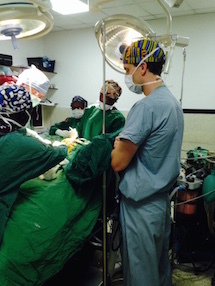 As a visiting anesthesia resident at Kijabe, I was able to provide direct medical care by managing the hospital's more complex cases directly. Some of the more challenging cases during my stay included a neonate for tracheoesophageal fistula repair, a 3 year-old for VP shunt with a history of extremely challenging intubation, a patient in septic shock from necrotizing fasciitis for lower extremity amputation, and a 7 month-old with an obstructing supraglottic cyst for resection. I was also frequently called on to answer questions about anesthesia management as a consultant to the nurse anesthetists regularly working at Kijabe and take overnight and weekend call in the 5-bed ICU. My other primary role was as a teacher for the nationally-recognized nurse anesthetist training program at Kijabe. I provided more than twenty hours of formal lectures and teaching conferences on anesthesia topics in addition to the daily tasks of guiding students through routine cases. I was continually impressed by how engaged and receptive these students were, and was rewarded by the knowledge that many of them will go on to work in extremely resource-limited rural settings where their training will go to great use serving patients who would otherwise have no access to safe anesthesia care.